The scope of the journal extends to the environmental, management and economic aspects of biomass and bioenergy. • Biomass: sources, energy crop production processes, genetic improvements, composition. Please note that research on these biomass subjects must be linked directly to bioenergy generation. • Biological Residues: residues/rests from agricultural production, forestry and plantations (palm, sugar etc), processing industries, and municipal sources (MSW). Papers on the use of biomass residues through innovative processes/technological novelty and/or consideration of feedstock/system sustainability (or unsustainability) are welcomed. However waste treatment processes and pollution control or mitigation which are only tangentially related to bioenergy are not in the scope of the journal, as they are more suited to publications in the environmental arena. Papers that describe conventional waste streams (ie well described in existing literature) that do not empirically address 'new' added value from the process are not suitable for submission to the journal. 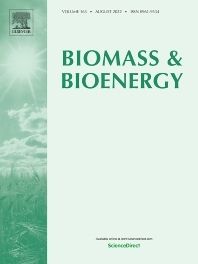 • Biomass and the Environment: carbon cycle, the net energy efficiency of bioenergy systems, assessment of sustainability, and biodiversity issues.